Are you a virtuosi violin player? Or do you often sing the famous aria of the Queen of the Night in the shower? Then you should perform in the Parisian metro. It has been the springboard to more than one career. Think about it, it could be the beginning of a promising career. Others have started here in the belly of Paris: Keziah Jones, Ben Harper, Manu Dibango, they all performed in the metro. But also Jacques Higelin and Alain Sauchon. Keziah Jones, now an international star, came back in 2008 to perform where he started his career in the summer of 1989. Why did he choose Paris back then? “It was close and Miles Davis was here”, Keziah said. He was playing Bob Marley and Marvin Gaye but was also testing his own compositions. The Parisian métro is indeed the densest transport system on the planet. There are 300 stations and that means: as many stages. Why do you need the Stade de France to perform? More than 5 million people travel on the metro every day. So start here, at Châtelet for example, where good musicians can easily make 20 to 100 Euros per hour. But careful: not every one is allowed to perform in the metro. 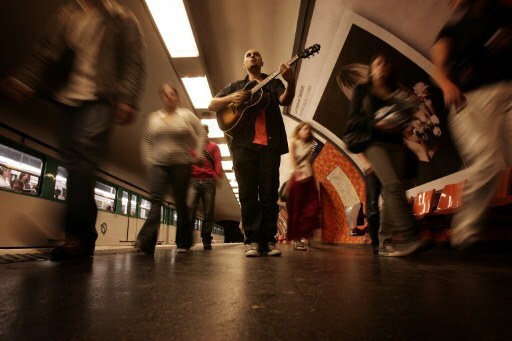 The RATP, the company that runs the metro, organizes auditions for musicians twice a year, in fall and spring. They do not look for a special style, just talent. Reggae or opera, jazz or just you and your guitar, it’s up to you. Only half of the musicians are French, the other half come from all over the world. Since yesterday, 3rd of October, you can apply for an audition. It’s very easy. You just need to send a mail (musiciensdumetro@ratp.fr) or go to Espace Métro Accords to get the form and you’ll get your audition. Throughout it’s 12 years of existence, more than 10,000 people have applied. So watch out and give your best: each season about 1000 musicians try their luck, but only 300 of them will get the coveted accreditation.